EXTECH’s high performance daylighting systems are ideal for use in schools, training centers, and childcare facilities. Many organizations, including the U.S. Department of Energy, the Environmental Protection Agency, and the U.S. Department of Education promote the widespread use of daylighting in schools due to daylighting’s positive impact on student performance and student behavior, its environmental benefits, and its economic advantages. Not only do our translucent walls, canopies, windows, and skylights provide comfortable, diffused daylighting, but they are highly impact resistant, providing a safe environment whether learning in the classroom or seeking shelter (as schools are often emergency shelter locations during dangerous weather). Additionally, our systems are tailored to meet the needs of the project, resulting in both immediate project cost-savings and reduced lifetime maintenance costs. EXTECH’s LIGHTWALL translucent wall systems have delivered “healthy school” solutions for many educational facilities. The comfortable, diffused daylighting provided is one factor that makes the LIGHTWALL so popular for the learning environment – daylighting has been linked to higher test scores, lower absenteeism, and positive thinking. 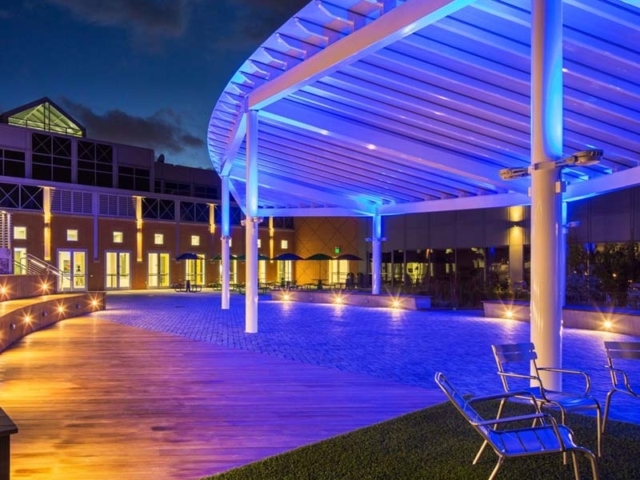 Our LIGHTWALL systems can often be customized for the intended application. For instance, the polycarbonate wall panels can be ordered in a variety of colors and translucencies (think school colors). For many applications, polycarbonate panels are superior to glass. Opal panels, which provide more light diffusion, can also be added should your design need both daylighting and privacy. Furthermore, polycarbonate reduces the glare that is traditionally seen with glass, and it protects against UV radiation. Polycarbonate panels can even provide superior sound-proofing characteristics. Though we specialize in using polycarbonate glazing, we have systems available that can accommodate glass as well. 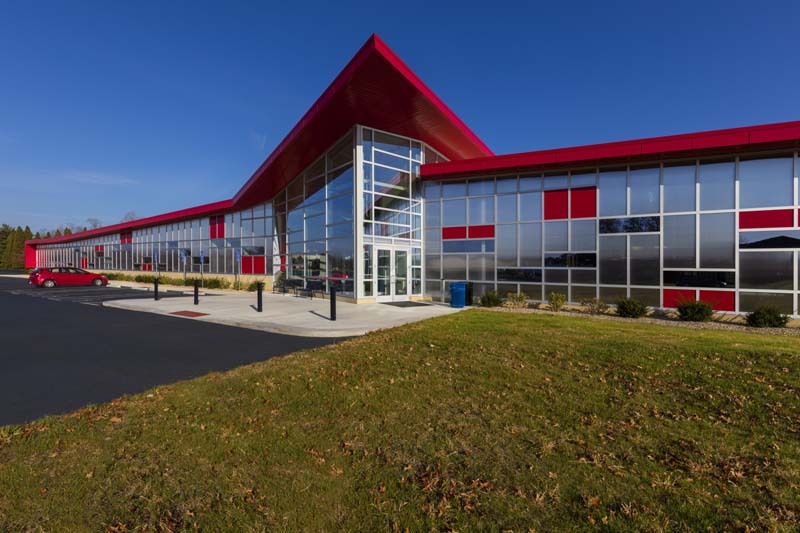 In our work on Otterbein University’s STEAM Innovation Center, we utilized our LIGHTWALL 3000 curtain wall system. The LIGHTWALL 3000 accepts polycarbonate, glass, and metal panels and was used to create a stunning geometric façade. The glass portions of the multi-glazed wall allowed for vision glass where necessary, while the polycarbonate portions provided diffused daylighting and reduced solar heat gain and glare. Products used in the educational environment must meet the immediate construction budget, as well as reduce on-going maintenance costs. To minimize initial installation costs, our systems are shipped fully fabricated, thus requiring less time to install. In some instances, we can even customize the system, to simplify building attachment and speed installation. Because funding for schools is tight and maintenance budgets are often the first to be slashed, we understand the importance of systems that are economical to maintain. Our aluminum framing systems are very robust, and the polycarbonate glazing requires no on-going maintenance – beyond routine cleaning. When compared to other systems commonly used in educational projects, our systems have a much longer lifespan. 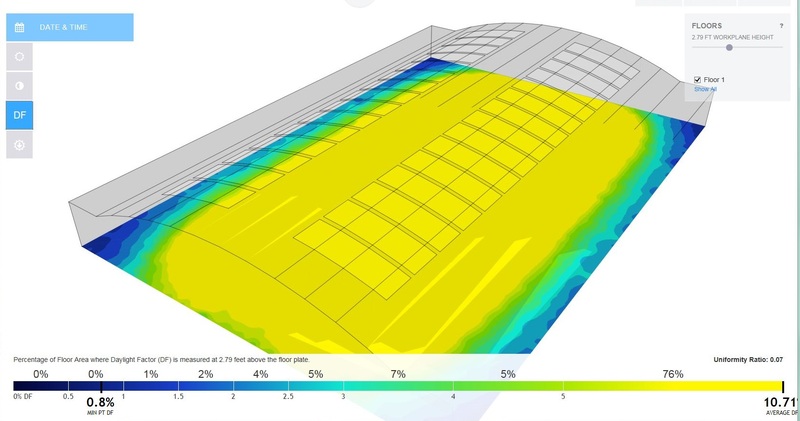 Polycarbonate daylighting solutions do not require ongoing protective coating like Fiberglass Reinforced Sandwich Panels (FRP). Our systems are also UV resistant, and as such, will not yellow over time. 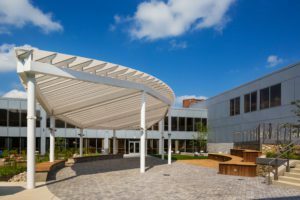 EXTECH’s SKYSHADE canopies offer shade coverage for college courtyards, school entryways, playgrounds, pick-up areas, basketball and tennis courts, bleachers, and more. The SKYSHADE system uses the most advanced aluminum perimeter framing system in the industry, and it offers UV protection, robust impact-resistance, and low-friction gaskets that deliver a long system lifespan. 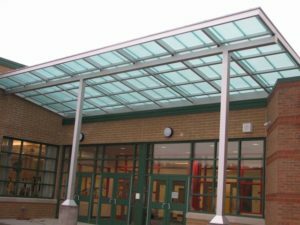 The polycarbonate glazing used with our SKYSHADE school canopies can be easily cold-formed to provide a radius look, at a substantial savings to curved glass. Curved canopies offer additional protection and an elegant aesthetic when compared to non-curved canopies. Our canopy systems are fully fabricated, which makes for easy, quick, and inexpensive installation in the field. The SKYSHADE canopies are customized to meet the specific needs of the design. 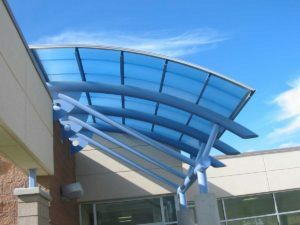 EXTECH’s engineers performed extensive customization for the courtyard canopy at Delaware Technical Community College (DTCC), such as engineering the use of full-length, monolithic polycarbonate (in 32’ lengths) to eliminate the need for cross-mullions, and designing a custom gutter assembly to shield users from rainfall run-off. The end result was an elegant, marquise shaped canopy that delivers shade and leak-resistant protection. 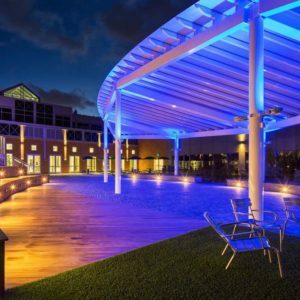 EXTECH’s SKYSHADE canopies are available in a variety of colors and translucencies, and are built with framing that comes in a variety of finishes. Skylights are a key way to bring daylighting into a structure. EXTECH’s leak-resistant SKYGARD skylights are lightweight, easy to install, and can endure a wide range of weather types. Due to their robust engineering, they offer superior resistance to air and water infiltration, as well as superior condensation resistance. This performance makes SKYGARD skylights ideal for educational facilities that house paper materials, records, and expensive computer equipment. Glare caused by skylights (as well as other daylighting systems) can be a potential drawback to incorporating them into a project. However, the polycarbonate glazing utilized in our skylights reduces glare and reflectivity that can impact student productivity. There are many translucencies and colors to choose from, and polycarbonate can be diffused at varying levels to create a softer glow as needed. 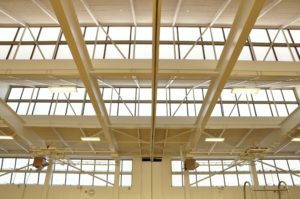 The daylighting offered by SKYGARD’s skylights help schools save on energy costs and achieve LEED status. 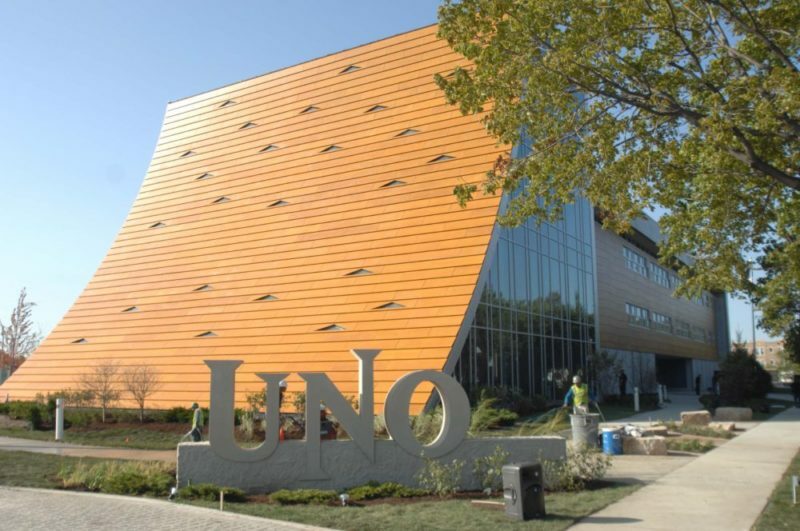 Our skylights can also be customized to act as windows in structures with sloped walls, as was achieved in our work for the UNO Galewood Charter School. Healthy school environments depend on healthy indoor air quality (IAQ), as determined by the EPA. Gymnasiums, art rooms, and vocational training centers all have reasons for additional means of ventilating that can augment the HVAC system. Massive natural ventilation can be achieved by using EXTECH’s TECHVENT 5300 top-hinged windows, a system that can be installed in continuous runs (or single units) and was designed to be left open during normal rainfall. The TECHVENT 5300’s ventilating capabilities have helped clients achieve outstanding energy savings. Because the system utilizes pre-assembled units that simply clip into the continuous hinge-bar, installation of TECHVENT is relatively easy and economical. The TECHVENT 5300 can be operated either manually or electrically with an optional control system, and can even be integrated with the building’s HVAC controls. 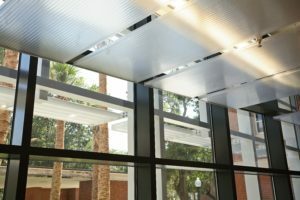 This type of control integration allows the HVAC system to utilize natural ventilation while still admitting daylight into the structure – unlike fixed metal louvers, or other venting. The TECHVENT 5300 has also helped schools meet rigorous environmental standards, as detailed in our case study for the Martin Luther King Jr. Middle School in California. 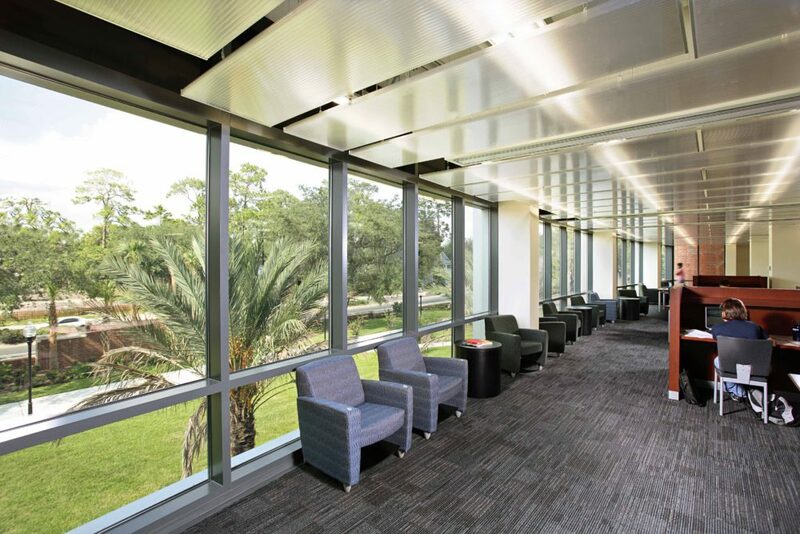 The FLEXI-PANEL is a translucent ceiling panel system that takes the edge off stark fluorescent light by diffusing it. The diffused light delivered by the FLEXI-PANEL is ideal for classrooms, libraries, and study centers that demand well-lit environments but need to be comfortable spaces that facilitate learning. The FLEXI-PANEL offers “easy-hinge” access to the ceiling area above the panels, which makes for budget-friendly maintenance and cleaning on not only the panel system, but components in the ceiling as well. The FLEXI-PANEL is easy to install, and can be installed with varying height supports to produce sweeping vertical curves. The polycarbonate panels are sustainable building materials and come in a variety of colors and translucencies. 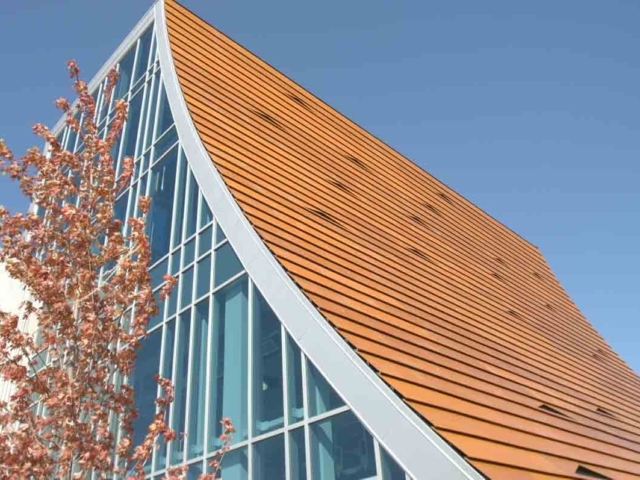 EXTECH has engaged in many custom design projects over the years which have required innovative engineering and non-traditional façade materials. 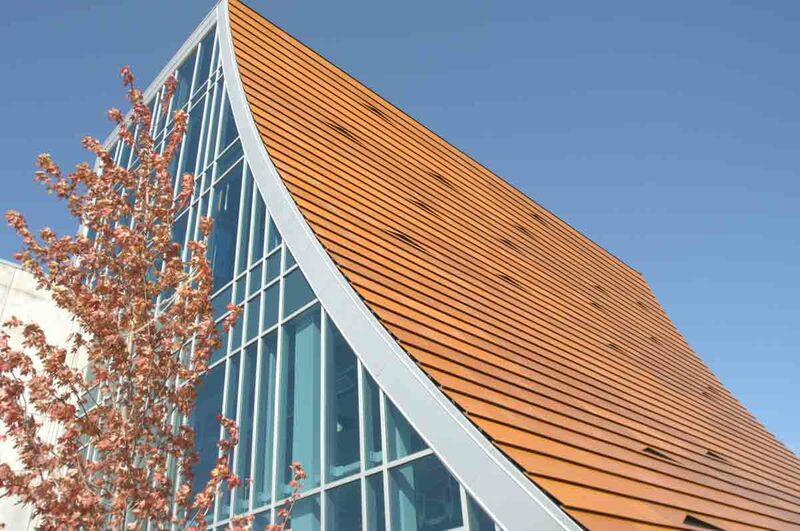 Some of these custom designs have used Prodema wood-faced panels for the cladding, a material with a deep, earthy hue. 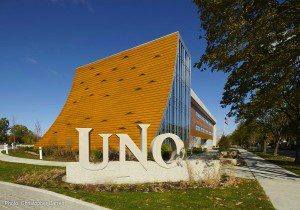 One of our most talked about custom projects that used Prodema is the UNO Galewood Charter School in Chicago, IL. 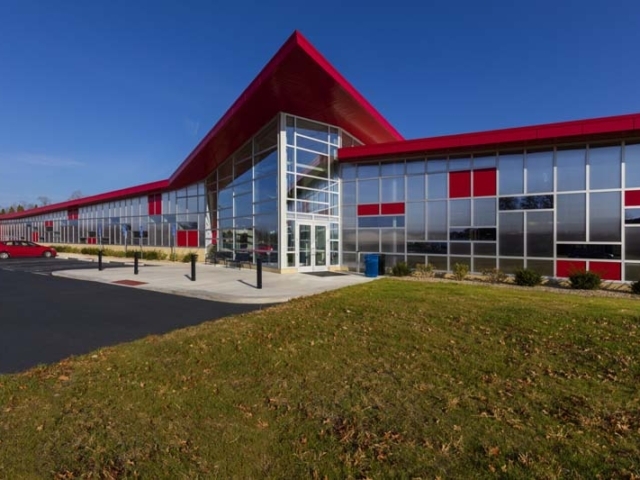 The architect for this school wanted a sloped wall that was punctuated with skylights; every skylight manufacturer they approached told them their only option were curbed skylights, meaning the skylights would not be flush with the sloped wall. However, EXTECH was able to design custom-framed extrusions for the skylights that were watertight, allowing integration of the shingled Prodema panels, the skylights, and the roof into one structure. This solution delivered the flush aesthetic the architect desired, and sustainably reduced costs because a secondary rain screen structure was no longer needed. At EXTECH, we understand the task of taking a project from concept to implementation. We partner with all stakeholders to engineer high-quality solutions that enchant the eye while respecting the bottom line. Working closely with clients is key to solving challenges, and we’re committed to seeking every engineering avenue possible to deliver on the ideas for your school application. 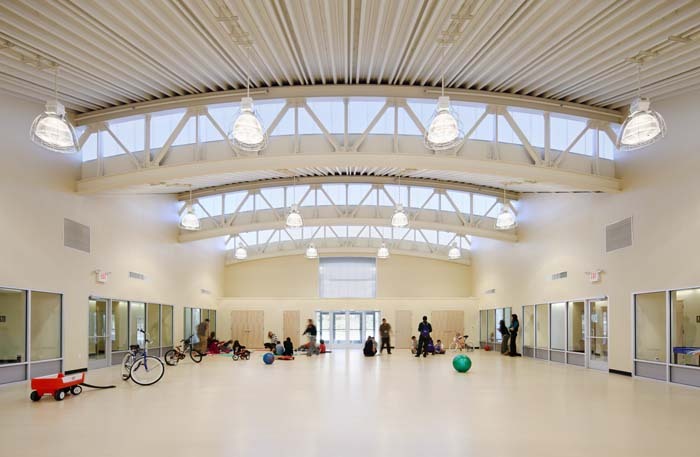 Because a typical school or childcare center has four times as many occupants as most other facilities with the same amount of floor space, it’s important to consider the effects that daylighting will have inside the structure. For instance, the amount of daylighting incorporated into your project must consider the light levels (measured in lux) at various points through the structure. This is typically done with a daylighting study. EXTECH regularly performs daylighting studies for educational facilities to ensure they harness the optimal amount of daylight that will illuminate the building without causing excessive solar heat gain, inflicting a heavy demand on the HVAC system, or causing excessive glare. Our engineers simulate school designs in a virtual setting that analyzes the building’s orientation and considers the light levels throughout the year. 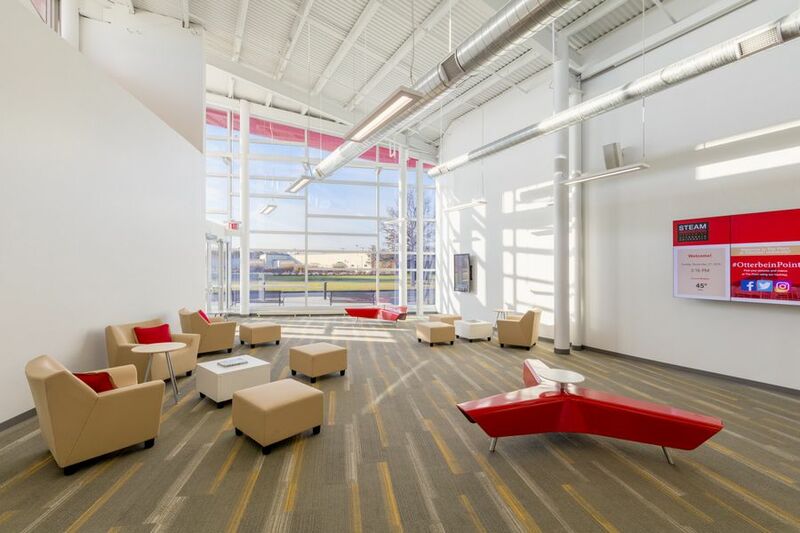 This removes any doubt over daylighting’s potential to illuminate the school or learning center where lighting is most needed, and allows architects and lighting designers to protect how much supplemental electrical lighting is necessary. Educational entities often face funding challenges when constructing new facilities. 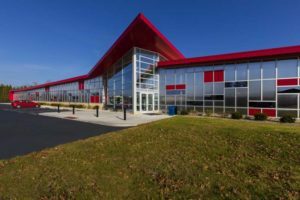 Despite these funding challenges, schools often maintain green construction and LEED certification goals. Our polycarbonate systems are economical and offer 100% recyclability, and they have been tested to meet rigorous environmental standards. Additionally, the daylighting offered by our systems can earn school construction projects credits toward LEED certification. The sustainability of our products do not incur a trade-off on budget savings - the custom fabrication EXTECH provides for each project results in a longer system lifespan, keeping repair and construction costs low. The polycarbonate glazing used in our systems is more resilient to breakage than glass, and it does not yellow or delaminate like fiberglass reinforced panels. Additionally, our systems were designed for easy and inexpensive maintenance, further saving school budget dollars. Many educational facilities are moving toward EnergySmart and high performance building standards – making their schools and learning centers energy efficient, stimulating, environmentally responsive, and safe. EXTECH has performed many retrofits on buildings that were looking to achieve high performance by incorporating daylighting into the design. We are versed in not only adapting our systems to the design to make for a seamless renovation, but adapting our systems so they can be easily installed on active school campuses. Educational facilities must deliver more robust protection than many other application types, as they are often the community shelter location during dangerous weather. Our systems are designed to withstand hurricane-force winds, and are often used in regions that experience hurricanes on an annual basis precisely for this reason. Our systems have undergone a battery of ASTM testing to ensure resilience to the elements as well as wear and tear caused by humans. 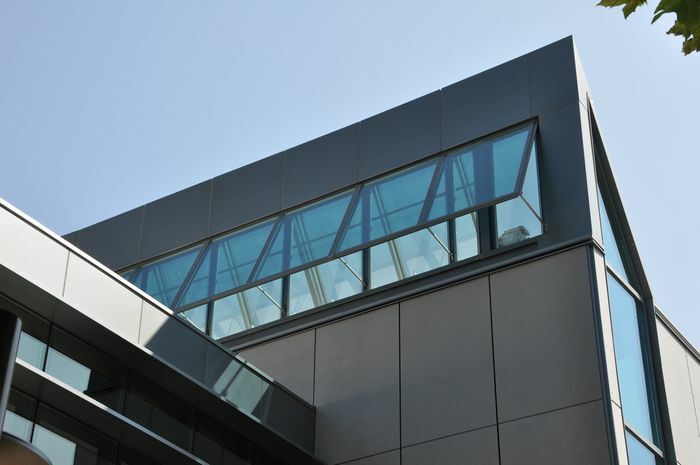 We offer polycarbonate glazing options that carry a Class A fire rating. Additionally, our systems are made with non-toxic materials and are lead free. EXTECH’s LIGHTWALL systems are ideal for school atriums, gymnasiums, classrooms, centers for interactive learning, school auditoriums, daycare centers, and vocational training facilities.